León Ferrari, The Words of Others, Trans. by Antena (Jen Hofer with Tupac Cruz and Román Luján), X Artist's Books, 2017. The Words of Others (Palabras ajenas) is the first full English translation of the Argentine artist León Ferrari’s uncompromising literary masterpiece (1967). A critique of the Vietnam War and American imperial politics, the book weaves together hundreds of excerpts from newspapers, periodicals, works of history, the Bible, and other sources. Ferrari conceived a dialogue among supposed voices of authority, insisting on the equal complicity of individuals such as Hitler, Lyndon Johnson, Pope Paul VI, and God in perpetuating unending cycles of violence. This translation results from nearly three years of work, including thorough investigation of Ferrari’s sources. It accompanies an exhibition of seminal works by Ferrari, curated by Ruth Estévez, Miguel A. López, and Agustín Diez Fischer at the Gallery at REDCAT as part of Pacific Standard Time’s Los Angeles/Latin America initiative, which will see the text performed by a cast of over forty artists, actors, and other recognized figures. León Ferrari and Mira Schendel: Tangled Alphabets, The Museum of Modern Art, 2009. 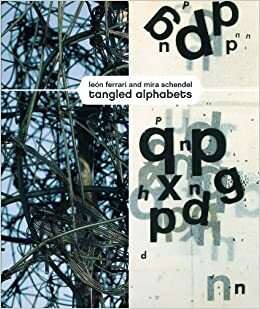 Tangled Alphabets charts the careers of León Ferrari and Mira Schendel, two twentieth-century artists who made language central to their dense, lyrical explorations of the visual world. The earliest piece by Ferrari on display is “Mujer” (Woman) (1960), a simple and delicate jug-like form that renders the slightly distorted fullness of a pregnant female body. Ferrari experiments with the alphabet in a similar fashion. His animated depictions of words and letters expand with volume until they settle at the edge of legibility. After an early engagement with paintings composed of flat geometric forms, dark muted colors, and thick, grainy textures, Schendel’s work became concerned with mark-making that aligns the act of writing with drawing and evokes the passage of time. In the 1960s, she began placing thin sheets of Japanese paper on plexiglass stained with oil paint and then inscribing a visual collusion of lines, letters, circles, and words with sharp objects including her own fingernails. Drawings such as “A trama” (A fabric net (1960)) and her “Escritas” (Written) series resulted from this process. In these works, the almost transparent materiality of paper becomes a threshold between the physical immediacy of the present and the intangible passing of time. Only the work of Cy Twombly can compete with Schendel’s ability to make images composed of calligraphic gestures and scratches appear simultaneously time-bound and ephemeral, crafted and spontaneous. The graphic and expressive potential of the alphabet is the primary but not the only link between Ferrari and Schendel. Both bodies of work emerged out of traffic between European and South American modernism. Both used language to meditate on the tangled relationships among religion, politics, and the body, and their art indirectly testifies to the violence that shaped their lives. Ferrari was born in Buenos Aires to Italian parents. His father was an artist and an architect, and he trained to be an engineer. A piece such as “Carta a un general” (Letter to a general (1962)), an ink drawing of twisting and illegible words, foreshadows his work’s investment in writing against repressive forces. Ferrari actively protested the military dictatorship of Auguste Pinochet, and moved to Brazil in 1976. His son Ariel disappeared during Jorge Rafael Videla’s “Dirty War.” In São Paulo, Ferrari created “Planeta” (Planet (1979)), a spherical sculpture composed of stainless steel wire and the desire to create “an imaginary planet.” “Planeta” displays a gorgeous tension between transparency and opacity, fragility and sturdiness. The more you see through its netted form, the more the solid architecture of its composition comes into view. León Ferrari. Planet. 1979. Stainless steel, 51"(129.5 cm) diam. Schendel was born in Zurich to Jewish parents in 1919 and grew up in Milan as a Catholic. Still classified as a Jew, Schendel moved across Europe in her twenties to escape fascist persecution. After the war she settled in Brazil where her talent for drawing, which had emerged with an obsessive force in early childhood, transformed into an almost religious commitment to art. The Holocaust seems to have provoked in Schendel an urgency that manifested in her striking visual depictions of the human voice and its fragility. In the 1970s, Schendel began her “Toquinhos” (Little Things) series: pieces of transparent acrylic that hang from the ceiling, upon which Schendel places small acrylic boxes or windows that display and contain punctuation marks, numbers, piles of letters and thin pieces of fabric. In these “Toquinhos,” Schendel suggests that language emerges out of the transparency of nothingness, and the act of seeing holds language precariously in place.